Atlanta United confirmed that Argentine head coach Gerardo "Tata" Martino has declined to extend his contract with the MLS club and will leave after the 2018 season. Martino, who previously led Paraguay to the quarterfinals of the 2010 World Cup and Argentina to second place at the 2015 Copa America, immediately built Atlanta United into one of the most exciting teams in MLS, luring such players as Miguel Almiron and Josef Martinez to MLS. Best record over two seasons. The Five Stripes have a one-point lead over the New York Red Bulls in the battle for the 2018 Supporters' Shield and have qualified for the 2019 Concacaf Champions League with the best record in the last two MLS seasons -- its first two seasons in the league. Atlanta United's 69 points have tied the MLS record set by Toronto FC in 2017, and its 21 wins are tied the Red Bulls for an MLS record. No announcement has been made, but Martino is expected to become Mexico's national team coach. That announcement should come after Atlanta United's season ends. The name most often mentioned as the successor to Martino is Guillermo Barros Schelotto, who starred for the Columbus Crew when it won the 2008 MLS title and coaches Boca Juniors. Atlanta United has reportedly agreed to acquire Boca star Pity Martinez. He would presumably be the replacement for Almiron, who is expected to be transferred to a club in England during the winter transfer window. 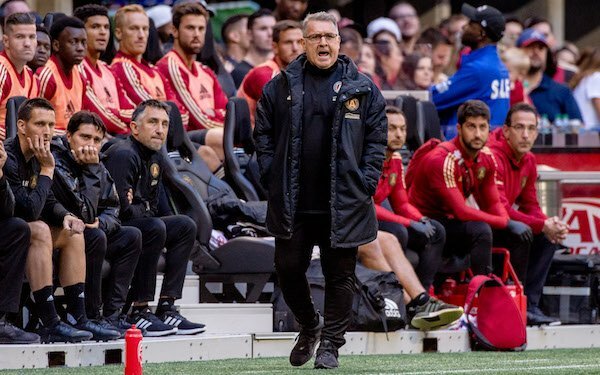 4 comments about "Tata Martino: Leaving Atlanta United 'was not an easy decision to make'". Bob Ashpole, October 23, 2018 at 11:35 p.m. Sad news, except that his time in Atlanta was a milestone for the league. Hopefully, Tata and other coaching greats like him will be part of MLS's future. frank schoon, October 24, 2018 at 9:36 a.m. This is a big loss for the MLS, for the fans, and for US soccer. I hope it has taught the MLS to bring in top quality coaches, who have played at a high level ,have coached quality teams, and have come from countries whose players are very technically oriented in their game. At this stage of soccer development in the US, this is the type of coach we currently need to bring our players to a higher level. Sorry but types like Jesse Marsch, Chris Armas, Jim Curtin,etc..with all due respect are simply not good enough. Many of them were simple water carriers or piano carriers when they played and will not contribute in raising the overal level of play; we need coaches who were former players with a creative bend, like an Henri, Vieira, Tata,etc....It is they who can raise the US game, not only through their of having played at high or highest in the best leagues, but also through their having knowledge and wisdom acquired from having played at high level, that can only benefit the US player. I would also like to know if the USSF approached Tata for the USMNT job, if not WHY and if he were why didn't he acccept, what were the reasons. I expect a big interview from SA with Tata, in regards to what he thinks of the US player, what they need to improve on,how to overall improve the US game, tips on developing kids playing, what he thinks of the time taken in looking for a USMNT coach, and his overal impression on how teams in the MLS should play, and about the US style. Albert Harris replied, October 24, 2018 at 10:03 a.m.
Frank often drives me nuts with his rants, but this time I'm in complete agreement with his points, particularly was Martino approached about the national team job. Over to you, SA for the big interview. I think we'd all like some answers. Bob Ashpole replied, October 25, 2018 at 1:55 a.m. Meanwhile Tab Ramos is still working with the US U20s, and Hugo Perez is still not working with the National program in any capacity. Neither one is ever mentioned as a candidate. Both are better qualified than the candidates in the news, except of course for Tata. I wonder why everyone assumes he will be hired by Mexico instead of the USA? Could it be that the US job description is unacceptable to an experienced national team coach?